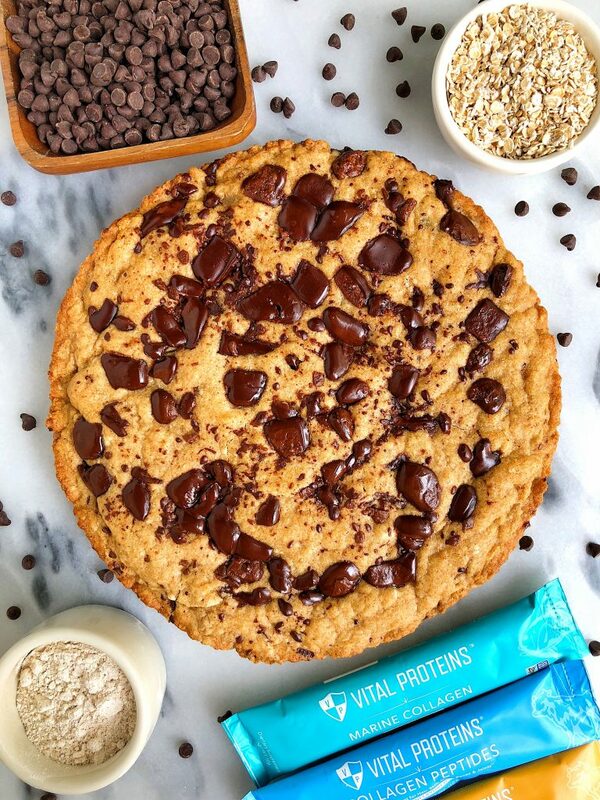 Doughy Chocolate Chip Cookie Pizza made with gluten-free and nut-free ingredients and with an extra boost from collagen peptides! You guys. This recipe is going to be your new favorite dessert. I don’t like to make bold claims but this Doughy Chocolate Chip Cookie Pizza is one of the best things I have ever eaten. I ate half of the pizza in two days and then gave the rest away to friends because I couldn’t stop. It is so delicious, flavorful and easy to make. Almost too easy to the point where you will want to make it after dinner because there is minimal clean up and effort involved. The upside is that this recipe is refined sugar-free, gluten-free and I added some extra collagen peptides in there. By adding collagen, we just added some protein to this recipe (you don’t even taste it) and it’s a extra boost for our hair, skin, digestion, SO MUCH. More on my love affair/obsession with collagen here . I use Vital Proteins collagen peptides and marine collagen daily. Usually it is in my hot tea but I love baking with it and getting creative using it in the kitchen. You can add to your coffee, smoothies, in pestos, anything. 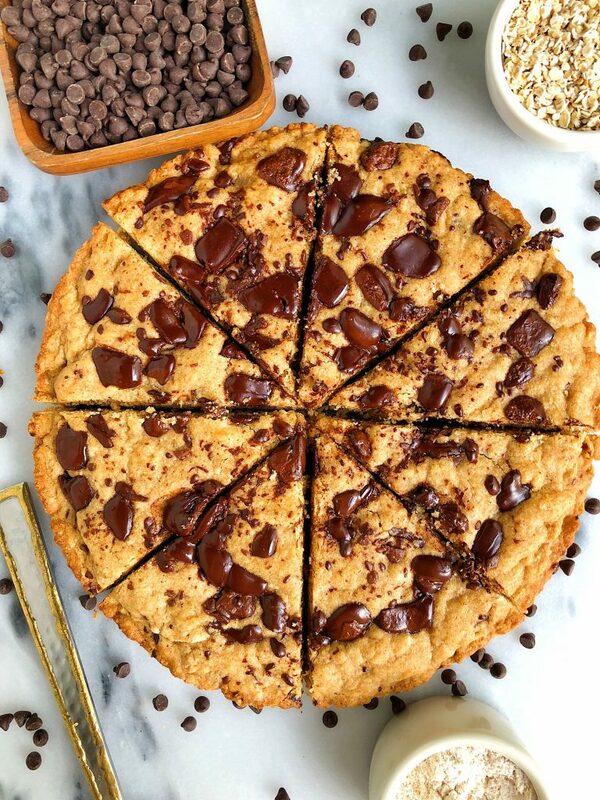 What I also love about this Doughy Chocolate Chip Cookie Dough Pizza is how rich it tastes without having lots of processed ingredients in it. Add a scoop of your favorite ice cream or coconut ice cream on top and you’ll have yourself an epic sundae. You can also make this recipe into cookies if you prefer, just alter the bake time a bit. But the doughy works for cookies or pizza form! I can’t wait to hear what you guys think. Don’t forget to tag me on social if you make this recipe too. ENJOY! 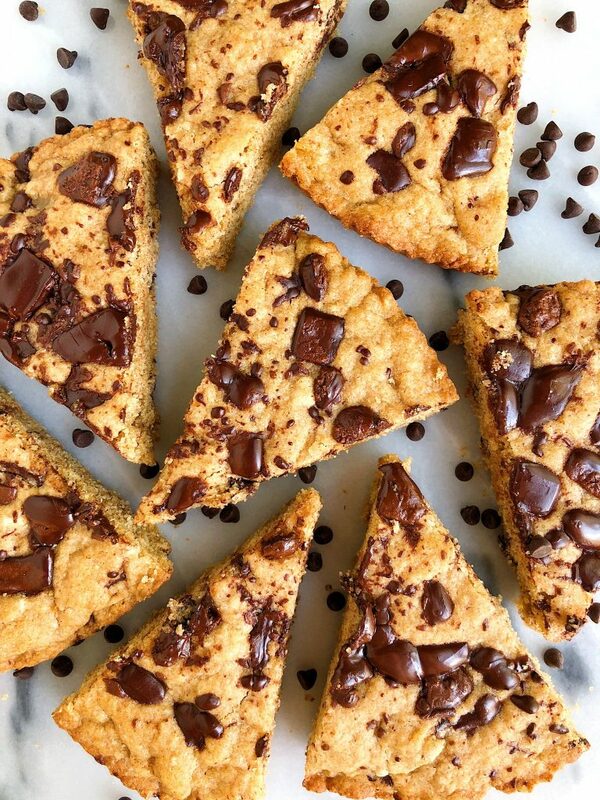 Allow the cookie pizza to cool then slice and enjoy! Thank you Vital Proteins for sponsoring this post. It means so much to me to work with brands I love and believe in! Can you substitute something else for the butter?